This is the view of the back door from a little way out into the yard. Wow, the back has gotten really overgrown! The door needs repainting, and the volunteer maples need thinning, and the stair railings need tightening. The deck should probably be demolished altogether, quite honestly. I used to shoot up there against the back of the house, but models kept getting their heels stuck in rotted boards! You're seeing part of my vintage watering can collection. I'm thinking I might part with that when I move...maybe keep the best 3-5, and let the rest of them go. Sigh. 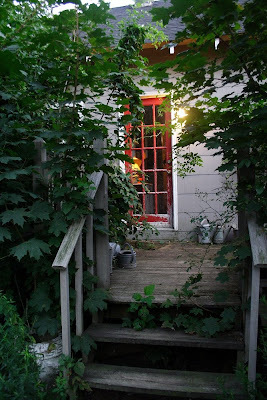 this is a great photo, I love the red door.